Kolkata, April 12 (IANS) Three more people were arrested in connection with the Presidency University vandalism, taking the total number of people arrested in the incident to five, police said Friday. "We have arrested three more people in connection with Wednesday's vandalism at Presidency University. They have been booked for several offences, including destruction of public property," Joint Commissioner of City Police (Headquarters) Jawed Shamim said. The latest arrests were effected late Thursday night. The police arrested two of the five accused earlier Thursday. All the five accused were presented in a city court Friday. 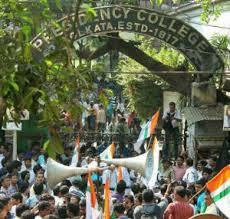 Police, however, refused to comment on the political affiliation of those nabbed..
Armed with sticks and rods, Trinamool Congress Chhatra Parishad members allegedly stormed the Presidency University campus Wednesday, assaulting students, including women, and vandalised its famous physics department. The miscreants ransacked the heritage, century-old Baker's Building which houses the physics laboratory where eminent scientists like Jagadish Chandra Bose, Satyendra Nath Bose and Meghnad Saha conducted research. Vice chancellor Malabika Sarkar, who has gone on record as saying that the vandals carried the ruling Trinamool Congress party's flags during the attack, asked Trinamool chief and Chief Minister Mamata Banerjee and Governor M.K. Narayanan to ensure that the miscreants get exemplary punishment. The vandalism was part of a series of alleged statewide retaliatory attacks after Trinamool supremo Banerjee and her Finance Minister Amit Mitra were Tuesday heckled in Delhi by activists of the Students Federation of India, the students wing of the Communist Party of India-Marxist.